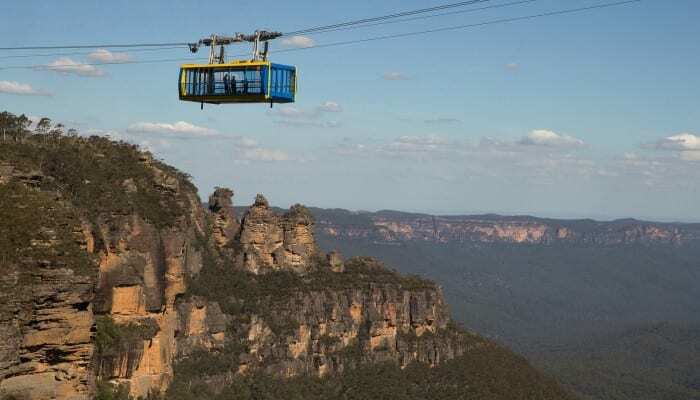 Katoomba is in the heart of The Blue Mountains and the most visited town. It wasn’t until 1879 that the town of Katoomba became known when J.B. North opened the Katoomba Coal Mine. Coal was obtained from the side of the mountain near Orphan Rock using a cable car to bring the coal to the top. The now famous Scenic Railway operates in the original cutting in the mountain side. The Three Sisters at Echo Point is only a few minutes stroll from The 3 Explorers Motel. 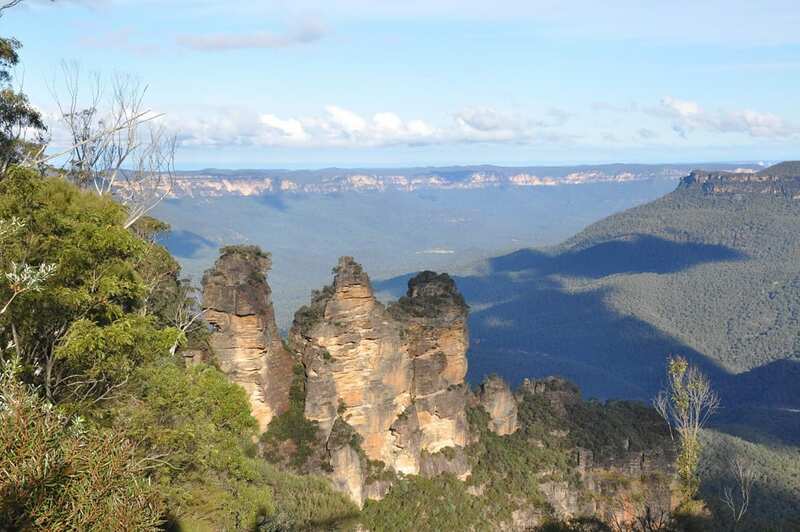 A visit to the Blue Mountains would not be complete without viewing the spectacular Three Sisters at Echo Point. Directions to the Three Sisters are well signposted. Either take Katoomba Street or Lurline Street to Echo Point Road. The Three Sisters is approximately 2.5 kilometres from the Great Western Highway or Katoomba Railway Station. While the Blue Mountains features so much more than this natural attraction you can’t help but admire the unquestionable beauty of this amazing rock formation. The character of the Three Sisters changes throughout the day and throughout the seasons as the sunlight brings out the magnificent colours. The Three Sisters is also floodlit at night looking even more stunning set against the black background of the night sky. For those wishing to know more about the Three Sisters, the Aboriginal Dream Time Stories are well worth a read. The famous Giant Stairway is also found at Echo Point. If you are enthusiastic and energetic, you can take the 800 steps down to the floor of the valley. Katoomba’s Echo Point Visitor Information Centre is located at Echo Point where you can experience spectacular views as well as an up close view of Rosellas feeding on sunflower seed. The centre has many Australian gifts for sale and can provide you with a vast array of information on things to do and see within the area, and how to get there. 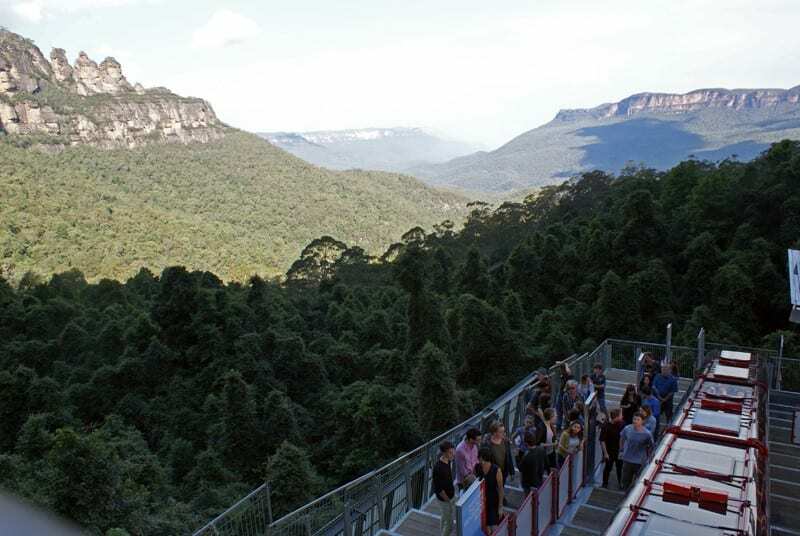 The Scenic Railway is the steepest railway incline in the world and is now one of the most popular man-made tourist attractions in Australia. The ride takes you down the steep descent past Orphan Rock, through a tunnel and the beautiful fern-damp cliff face. Adjacent to the Scenic Railway is the Scenic Cableway, the steepest aerial cable car in Australia. The Scenic Cableway takes you on a 545 metre ride into the Greater Blue Mountains World Heritage Area rainforest of the Jamison valley. Scenic World also features a spectacular Scenic Walkway. A popular option for visitors is to descend into the valley via the Scenic Railway, stroll along the Scenic Walkway and ascend to the top via the Scenic Cableway. Also at the same site is the magnificent Scenic Skyway. The original Skyway was Australia’s first cable Skyway for passengers and was built in 1958. The new Skyway with a glass bottom floor, can carry up to 84 passengers across the Jamison Valley at a height of 200 metres. The views are breathtaking. For thousands of years, the Blue Mountains have been home to Aboriginal peoples, particularly the Gundungurra and Darug tribes. Even today, there are still plenty of traditional Aboriginal peoples living in the Blue Mountains, where there are now a number of cultural sites that walk visitors through the region’s rich past and share the customs and heritage of the local tribes. Katoomba The area’s scenery and art deco-style shops and houses attract an alternative subculture. Many poets, artists and environmentalists reside in Katoomba and the Blue Mountains generally, and the town hosts the Winter Solstice festival, Winter Magic, that features local talent, art and handicraft. The festival was established in 1994 to provide a local focus for the Blue Mountains-wide Yulefest. Yulefest is a long-running tourism initiative that promotes Northern Hemisphere-style Christmas celebrations during the Australian winter months June to August. The dramatic rock formation known as The Three Sisters at Echo Point in Katoomba has become an iconic symbol for the Blue Mountains. At the Visitor Information Centre a trail leads to the top of the Three Sisters via Honeymoon Bridge from the Giant Stairway for panoramic views into the Jamison Valley. 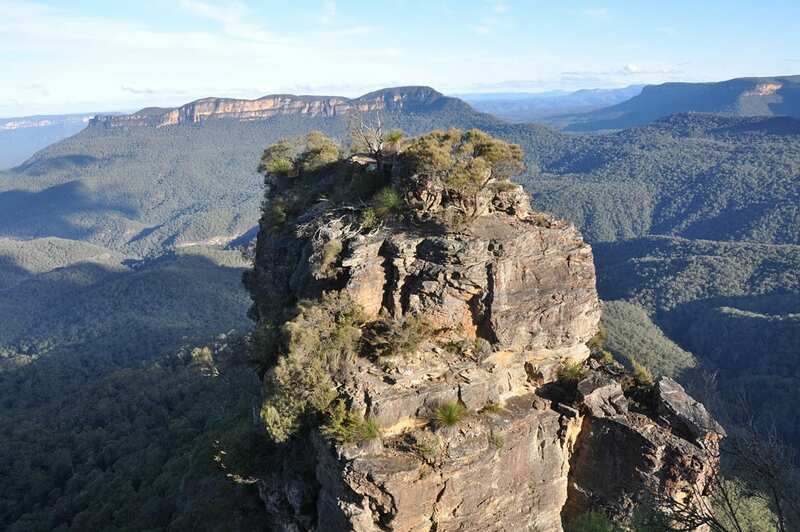 There are 140 kilometres of heritage walking tracks and hundreds of lookouts throughout the Blue Mountains region. The landscape is part of the traditional country of Aboriginal people including Daruk, Gundungurra, Wiradjuri and Dharwal. The eastern area embraces Glenbrook, known as the Blue Labyrinth, which includes camping areas, scenic picnic areas, Aboriginal cultural sites and swimming holes. The Greater Blue Mountains National Park is where you will find the recently discovered Wollemi Pine, survivors of the world’s oldest plants, unchanged for 200 million years. The Greater was given World Heritage listing in 2000.